Your website presence reflects your professional business image - good or bad. A well maintained website facilitates visitor interest and encourages repeat visits. This inevitably results in repeat business, thus its imperative that the content of your website must be enhanced and changed often. Your website is your digital business plan and its success evolves via fresh content, purpose and functionality. We work with our clients ensure websites truly have these necessary and vital components. 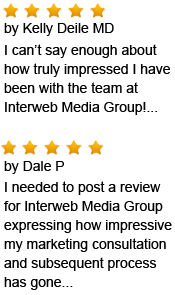 At INTERWEB we offer highly cost effective website maintenance solutions that help you reduce costs, increase efficiency and refocus your critical resources. From occasional updates to ongoing weekly maintenance, our maintenance plans are designed to fit your maintenance needs and budget. 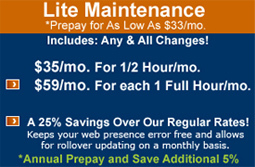 Our maintenance plans save over 30% off of retail rates, from only $35/mo.! Rates locked in for term signed and funded over 12 months. Rollover hours - maintenance hours useable for up to 1 FULL YEAR! Maintenance Plans starting with only 30 minutes of designer time/mo.! NO surprise fees, same monthly budget! Cross Browser and Cross Platform Compliance. Looks the way you want to every user! Convenient monthly billing, allowing for controllable costs. Access to real time reporting and maintenance account status reporting. NEW FEATURE!